I’d had been looking forward to this tournament all year, and not only because I love rugby playing women … uh, I mean coaching them … I continue to coach the female game for several reasons, and one is that without all that bulk and bullheadedness, women are more likely to look for space than try and run someone over. For anyone who watched the whole tournament, this was again proved to be true. There were some fantastic tries on offer, and well-worked ones too which featured clever running lines and deft handling. When it all came down to it, the two most dominant sides – even heading into the tournament – England and New Zealand found each other again squared off in the final. For those who hadn’t watched any WRWC matches, this might not have given them the impression I’d mentioned earlier about a free-flowing, attractive brand of open rugby, but what rugby final is ever that? I’d watched every pool match – every match, actually – up to the final, and don’t think Corrigan was inconsistent with the way the games were reffed by anyone throughout. The tempo was set in the encounter between Australia and Wales, and really every team should have ‘adjusted’ then if not before because the directives about rolling away and releasing the tackled player have been in place for a while. After watching that game, I watched a 3N match and it struck me how different general play looked. From one that was relatively clean and free from penalisable infringements at the break down, to one where they were rampant and the ref could only address the ones which were most blatant while trying to be consistent. The women’s game was the ‘cleaner’ of the two. My impression of the final was that Corrigan gave plenty of warnings and certain players didn’t heed. In the cases of the yellow cards, each player had done something to slow down play – which is what the IRB has been focusing on all year. I’m just a beginning ref, so might not be the best to comment, but on review of the ‘penalty try’ that wasn’t, McLean was there so quickly to clean up the charge down that maybe only a penalty should have been called? I’d like to hear the thinking on that one – but the rest of the match seemed pretty fair to me. 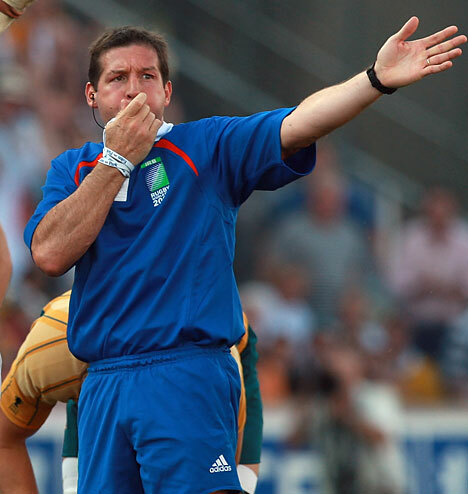 With these new directives strictly enforced, the game will open up – as the last few Tri-Nations matches have – and flow a lot better as defenders are prevented from spoiling quick ball. 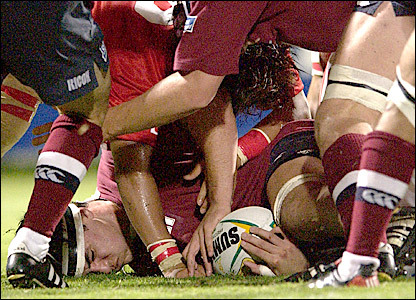 Last year, players were always flopping on the wrong side of the ruck, forcing scrum halves to tip toe around them (buying time for defenders to get organised); persisting with hands in the ruck and going off their feet to the wrong side again to do so; and the whole issue with the tackler having to release before playing the ball may have cut down on some impressive turnovers, but those were hardly fair to the ball carrier who never had a chance to play the ball with someone holding/lying on top of them. If you’ve watched any of the last few Tri-Nations matches, and remember what they were like last year, you’ll note how wide open the game has become as quick ball tends to translate into more people on their feet (i.e. 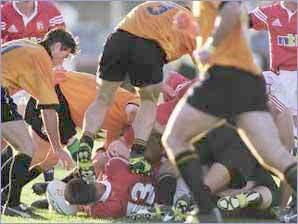 less having to go in to clean up a messy ‘ruck’), and more opportunities in attack as defenders haven’t the time to get organised. Stop the Clock! You’re wasting time! Sydney Morning Herald columnist Greg Growden seems to find ways of stirring rugby controversy every now and then and his latest article is true to form. The media Down Under have reported in recent times that fans attending matches are down (while ignoring how many are watching at home and via the web in other countries – not that I’d ever do that! 😉 ), which contributed to the debacle that was the ELV trials, and his recent suggestion to make the game more attractive to the masses is to stop the clock every time the ball goes out of play. I think the rationale is that ‘fans’ want to get their money’s worth and see an actual 80 minutes of match play. I can’t bear reading it again, as it’s just one more daft idea in the quest to change a game that really doesn’t need changing. Many in the New World do not know that rugby didn’t even go pro until the early 90s, and since then it has undergone quite a few growing pains in terms of being able to be competitive but not exceed its resources. In a professional system, players are paid (duh), and money can entice good players to join, which can breed success, which builds a fan base, who provide more money and feed the cycle … yadda, yadda … so at least some sections of people in the ‘new’ professional rugby are concerned with making the game more ‘attractive’ to get more bums in seats, as the phrase goes. Though I only was introduced to rugby in 1997 (and haven’t looked back at my gridiron / basketball upbringing since), I consider myself a ‘traditionalist’ who after reading the history of a game which, in its organised form, actually PRE-DATES organised soccer (despite what legends would have you believe), loves not only its spirit but also the game it evolved into by the latter part of the 20th century. Maybe it wasn’t ‘perfect’ but every sport has such issues which are accepted as ‘part of the game.’ Time and time again over recent years people have suggested ways to make it ‘better’ – likely to get those cash-wielding aforementioned bums in seats – and they continually risk alienating those of us who think nothing’s wrong. In fact, I would really rather NOT see more bums in seats if it means changing the sport I love to something that it’s not. I fear this suggestion, which will thankfully be ignored, would be another step towards making rugby as boring as the other ‘football’ codes. Growden cites AFL as an example of how the fans get to see a full period of action because the clock is stopped when the ball is out of play. This is the same for the NFL. One of the many things I love about watching rugby is that I can watch a professional match in an hour and a half, and then get on with my day. For AFL and the NFL/CFL, you have to book off a solid three hours, not only dealing with stoppages in play, but commercial breaks during this period. (I won’t rant about the audacity of the ‘TV Time Out’!) I would be willing to bet heaps of money on this creeping into rugby – which is now relatively free of commercials – if stoppages in time were taken. I certainly don’t want that. That I can watch two matches in the span taken by one football game, or the pointless pre-match and match play of one soccer game, is one of the many things I love about watching rugby on Saturdays. Double the pleasure, and not just because our sport is much more enjoyable (quadruple the pleasure?). I’ve said it before, and I hope I won’t have to say it again now that the ELV period is over, but rugby doesn’t need any more fine tuning. It’s pretty damn good as it is. Recently, I was reading that despite the three hours it takes to watch an NFL match, there’s really only about 12 minutes of actual game play! I video taped our (amateur) matches last season, stopping the recorder for moments when the ball wasn’t in play, and have edited some professional matches as such so our players could analyse them. This reminded me that rugby, as is, contains between 35-42 minutes of action. Compared to the NFL’s 11-12 minutes, that’s pretty damn good value for money – if that’s how the big wigs want to look at it – in my books. How’s about everyone stop making silly suggestions to alter the best sport there is for all types of people and just let us sit back and enjoy it for what it is!